Roger Andrewes (or “Andrews”) (1574–1635) was probably the most influential of Cocking’s vicars in the Church of England nationally, although his influence on the lives of his parishioners in his three years as the vicar of Cocking was probably minimal. Andrewes was the younger brother of Lancelot Andrewes (1555–1626), Bishop of Chichester from 1605 to 1609, during the reign of King James 1, who oversaw the translation of the King James Version of the Bible. Lancelot Andrewes was no doubt responsible for securing many of the positions held by his brother, Roger, who was Archdeacon and Chancellor at Chichester Cathedral, and later the Master of Jesus College, Cambridge. Roger Andrewes was also a member of the First Cambridge Company with responsibility for translating a large portion of the Old Testament into English. Roger Andrewes was born in 1574 near Tower Hill in the All Hallows, Barking, parish of London, where he was baptised on 12 December 1574. He was the eleventh of twelve children of Thomas Andrewes and his wife Joan (née Belson). Thomas (1530–1593) was born at Hordon-on-the-Hill, near what is now Basildon in Essex, and was a prosperous mariner and ship owner, who became Master of Trinity House. It is not known where Andrewes received his early education, but in 1590, aged 16, he was admitted as a student at Pembroke College, Cambridge, where Lancelot Andrewes was a fellow and treasurer. 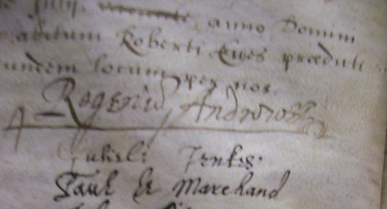 Roger Andrewes’ admission to Pembroke probably owed much to the growing influence of his elder brother. He graduated as a Bachelor of Arts in 1593, gained his M.A. in 1597, B.D. in 1604 and Doctor of Divinity in 1609; he was admitted as a fellow of Pembroke College in 1594. Andrewes was ordained as a priest at Lincoln Cathedral by William Chaderton, Bishop of Lincoln, on 14 November 1602. He was rector of St. Martin’s, Ongar, Essex from May 1603 to December 1605 when he was instituted as perpetual vicar of nearby Chigwell. He resigned this position in November 1606, having been collated as prebendary of the Wyghtring (Wittering) Prebend at Chichester Cathedral on 31 August 1606. His brother, Lancelot, had been installed as Bishop of Chichester in November 1605 and was to continue to have a significant influence on his brother’s career. In 1604, Lancelot Andrewes had been appointed by King James 1 as head of the Westminster Company charged with translating the Old Testament into English. Shortly after his appointment, Lancelot nominated his brother Roger to be a member of the First Cambridge Company who were responsible for translating the Hebrew text of the middle part of the Old Testament from 1 Chronicles through the Song of Solomon. At the time of his appointment, Roger was only about thirty years old and still five years away from receiving his doctorate. His individual contribution to the translation is unknown, although it was a team effort, where everyone contributed. The team’s work was completed in 1611, when the first version of the King James Bible was published. Andrewes was collated vicar of Cocking on 25 September 1606 and as rector of Nuthurst, near Horsham, on 8 October 1606. Under the patronage of his brother, Andrewes received further appointments, firstly as Chancellor of Chichester Cathedral on 16 October 1606, in succession to Henry Blaxton, and then as Archdeacon on 23 February 1608. He resigned as vicar of Cocking on 16 July 1609; his resignation was signed by his brother Nicholas (a London merchant) as proxy. Shortly afterwards, he also resigned as rector of Nuthurst and was then collated as vicar of Cowfold, near Haywards Heath, on 6 November and as vicar of nearby Cuckfield on 18 November. In October 1609, he also exchanged the Wyghtring Prebend for the Coleworth Prebend at Chichester, with Jerome Beale becoming prebendary of Wyghtring. Beale also succeeded Andrewes as rector of Nuthurst, having been the previous vicar of Cowfold. In September 1609, he was collated as prebendary of Muskham North at Southwell Minster in Nottinghamshire, in succession to his brother, Lancelot, who was now Bishop of Ely. In February 1618, Lancelot Andrewes, in his capacity as Bishop of Ely, presented his brother Roger as Master of Jesus College, Cambridge. Roger Andrewes was considered “a highhanded and unsatisfactory Master” and was widely disliked for his “bad temper and lack of scruple”. According to the history of Jesus College, he was “overbearing and quarrelsome, and treated his college with contemptuous disregard and seems to have resided very little”. As Master, he was responsible for the collection and disbursement of College revenues and for the preparation of accounts. Unfortunately, Andrewes personally retained money that should have been paid to the college and failed to produce annual accounts, or produced false accounts. He failed to pay the dividends that were due to the fellows of the college, resulting in several of the fellows being reduced to destitution, and the College being unable to pay its bills. Eventually, a formal complaint was made to the King in 1627; the matter was referred to three heads of house, who decided in favour of the fellows. The King ordering the Vice-Chancellor to take immediate steps to right the matters complained of (including appointing a bursar) but nothing was done, until the King ordered Andrewes to resign, which he did in 1632. The history of the college concluded that “it was only due to the royal favour in memory of his late brother that he was permitted to resign instead of being dismissed”. Because that many things have been done, and are out of order for want of registering those things that are done by ye consent in ye Colledge—Bee it decreed from henceforth that there shall be kept a continual Register. In February 1619, Lancelot was translated to Bishop of Winchester, following which Roger gained appointments in Hampshire, as Rector of Cheriton in 1622, and as Canon of the 7th prebend at Winchester cathedral in 1625. Lancelot died on 25 September 1626 and Roger was one of the chief mourners in the large procession that accompanied Lancelot Andrewes’ remains from Winchester House to Southwark Cathedral for his entombment. Andrewes spent his last years in Cheriton, where he died in September 1635 and was buried there on 11 September. He was married to Philippa Blaxton (née Cooper), the widow of Henry Blaxton, the son of his predecessor as vicar of Cocking. They had no children. Note 1 In the mid-16th century, the average annual earnings in England was about £6. Thus, the living was nearly three times average earnings. The modern day equivalent salary is about £8000, although the “economic status” is equivalent to a salary of £290,000.